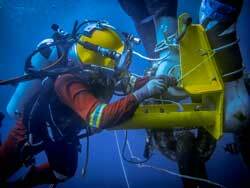 UMC International, a V.Group company, reports that business for its global underwater maintenance operations has been brisk over the past few months. Managing director Alan Trevarthen highlights energy efficiency as a key driver for a great deal of the company’s increased workload, with hull and coating inspections, and marine fouling removal from hulls and propellers, to the fore. UMC continues to develop new technology to support the enhanced environmental performance of its underwater inspection, maintenance and repair services. The company is, for example, in the process of bringing to market a closed circuit hull and propeller polishing solution, for use in UK, which will allow customers to reduce their impact on the environment and reduce fuel bills by improving efficiency. As well as reporting increased demand in the merchant shipping sector, UMC has also seen a resurgence in the level of support being requested by the offshore drilling market. This trend has been particularly evident in Asia, but the company is also receiving more requests from West Africa, Central America and Australasia. “As drill ships and rigs continue to move in and out of lay-up, the budget pressure is still there, but there is a growing need for essential work. We are well placed to support this requirement,” Trevarthen adds. This positive market trend has led to an increase in inspection and non-destructive testing (NDT), PRV and gauge calibration servicing, hoisting and lifting gear inspection and underwater inspection as an alternative to drydocking. At times in recent months UMC has seen more than 50 of its diver technicians working offshore at any given time. “A lot of our support has focused on lay-up anchorages where we have conducted side scan sonar seabed surveys to support rig positioning, subsea mooring chain and hawser inspections and replacements,” says Trevarthen. UMC has an impressive global network which it has recently strengthened with a new operational centre in Chennai, India, which is now handling all global enquiries and is available at all hours, seven days a week. In addition, UMC started operating in Algeciras in August last year, in partnership with Cleanhull. As a result its full range of capabilities is now available in Spain, in combination with the ROV hull cleaning technology provided by Cleanhull.